JAN-16: National Religious Freedom Day. Religious Freedom Day is observed yearly on JAN-16. This recalls the date in 1786 when the Virginia Statute of Religious Freedom -- written by Thomas Jefferson -- was passed. 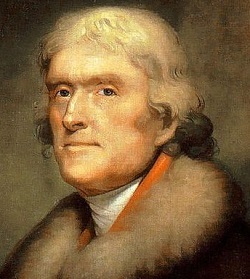 Jefferson wrote the Virginia Statute in 1777. It was promoted in the Virginia General Assembly by James Madison and passed by the Assembly on 1786-JAN-16. It promotes two main principles: personal freedom of conscience and the separation of church and state. The statute was a radical document for its time, because all or essentially all governments had an official state religion which was given special financial and other privileges. The text of "An Act for establishing religious Freedom:"
"Foremost among the rights Americans hold sacred is the freedom to worship as we choose. Today, we celebrate one of our Nation's first laws to protect that right -- the Virginia Statute for Religious Freedom. Written by Thomas Jefferson and guided through the Virginia legislature by James Madison, the Statute affirmed that "Almighty God hath created the mind free" and "all men shall be free to profess . . . their opinions in matters of religion." Years later, our Founders looked to the Statute as a model when they enshrined the principle of religious liberty in the Bill of Rights. "... Christians, Muslims, Jews, Hindus, Deists, Sikhs, followers of other religions, and those unaffiliated with any organized religion." It used to mean freedom by individuals and minority faith groups of: religious belief, religious speech, religious assembly with fellow believers, and religious proselytizing and recruitment. In the past, the individual believer was often the target of oppression by others -- typically large religious groups and governments. (This is the meaning that we generally use on this web site). "Burthen" is an archaic spelling for "burden." "A brief history," Religious Freedom Day, Gateways to Better Education, undated, at: http://www.religiousfreedomday.com/ This is an accursed PDF file. President Barack Obama, "Presidential Proclamation -- Religious Freedom Day," 2013-FEB-16, at: http://www.religiousfreedomday.com/ This is a PDF file.